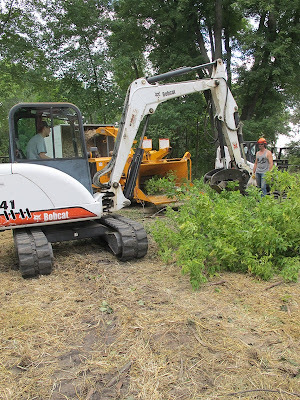 On Wednesday the Tree Farm hosted an intern work day for my fellow interns at the Aldo Leopold Foundation (ALF). Arik lent us his time and knowledge on some bigger equipment that we do not have at ALF. I have been fortunate to be able to use most of the equipment on a regular basis while working here this summer and I was thrilled to be able to share the experience with my fellow interns: Leann, Cameron, and Emily. 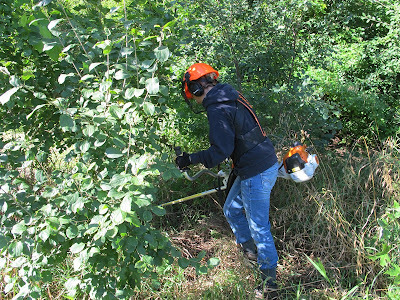 The three of us girls started the morning by familiarizing ourselves with the Stihl brush saw. We worked as a team to cut down Buckthorn and clear the area. One of us used the saw while the others removed the small trees and the other treated the stump with Garlon. 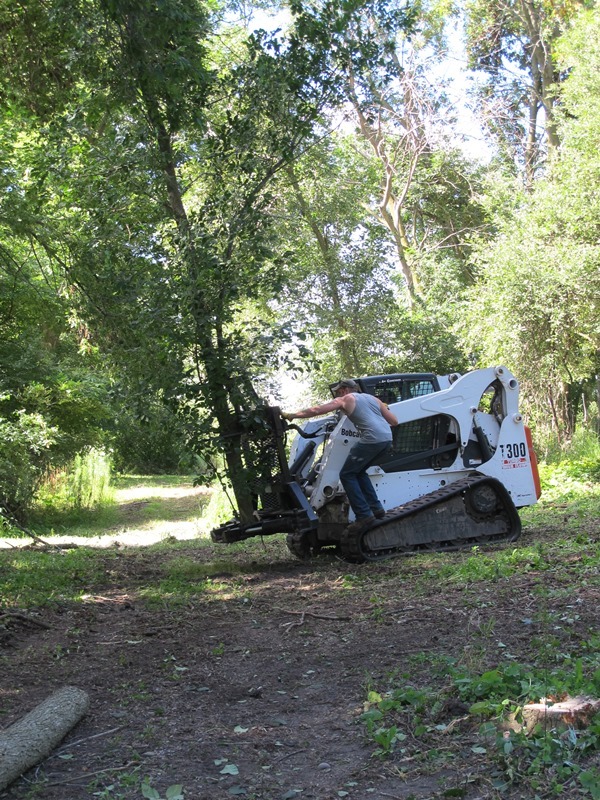 We put the Buckthorn in piles in order to practice using the grapple attachment on the 220 Bobcat. The 220 Bobcat with turf tires was equipped with the grapple attachment. It can be used to pick up a variety of things including brush piles. For the most part we all agreed that this was our favorite piece of equipment to operate. It was the easiest to control and the application we used it for had the smallest probability of disaster. We took the "small" (10' x 6') piles of brush and added them to a huge brush pile (40 feet in diameter) that will be burned this winter (feel free to come warm up your toes!). After using the grapple, we all watched Arik demonstrate how to take down a tree using the tree shear. The tree shear was attached to the 300 Bobcat with tracks. It maneuvered much differently than the Bobcat 220 with the turf tires -- luckily, Arik was there to guide us through our first experience with the tree shear. 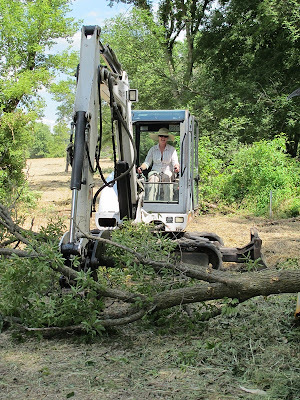 Using the tree shear was a bit challenging; there were a lot of buttons and movements with the joy sticks to remember. 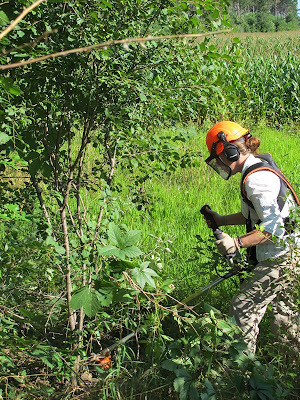 All of us were successful in removing at least one tree with the shear. Arik was successful in not dying -- you can see him bravely standing on the tracks to mentor us amateurs in the pictures below! Arik was nice enough to let me practice on a really challenging tree. It was leaning at 45 degree angle. 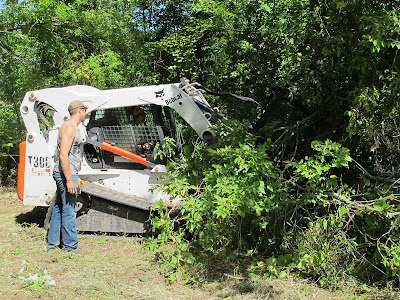 Here Arik and I are discussing the plan of attack on the Box elder with tree shear. After removing the trees with the shear, we loaded them into the chipper using the mini excavator. I did not personally get a chance to use the excavator this time, but am looking forward to practicing in the coming week. The other interns all said that it was the most challenging to use, but it sure made loading the chipper a breeze! Cameron operating the mini excavator to load the chipper as Arik stands by to offer advice. Leann gives the mini excavator a go. Overall, we all had a great day of learning and new experiences!